Image: Emma McIntyre/Getty Images for iHeartMedia, Prince Williams/Wireimage/Getty Images. Warner Bros. Design: Allie Gemmill/SheKnows. When the 61st annual Grammy Awards air in February, viewers will be treated to an especially memorable evening to celebrate all the music we loved in 2018. After an unexpected delay in announcing the nominees for this year’s show, the Recording Academy took to Apple Music and CBS News to stagger its announcements on Friday morning, then released the full list on the Grammy Awards website. 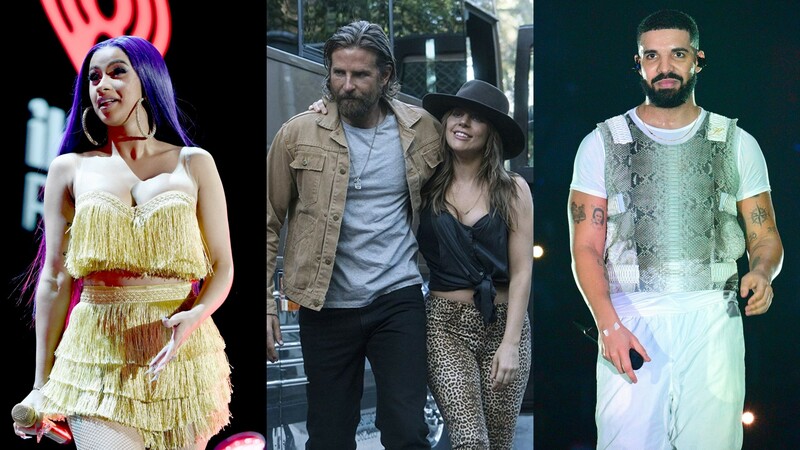 Likely nominees included performers like Cardi B, Drake and Kendrick Lamar — all of whom have multiple nominations across the extensive category lineup — while surprise nominees included Bradley Cooper and Lady Gaga for their work on A Star Is Born. With all this in mind, let’s check out the list of nominees. 🎉 Congratulations 61st #GRAMMYs Best New Artist nominees: @chloexhalle, @lukecombs, @GretaVanFleet, @HERMusicx, @DUALIPA, @MissMargoPrice, @BebeRexha, and @JorjaSmith! 🎉 Congratulations 61st #GRAMMYs Best R&B Album nominees: @tonibraxton, @leonbridges, @lalahhathaway, @HERMusicx, and @PJMORTON! 🎉 Congratulations 61st #GRAMMYs Best Rap Performance nominees: @iamcardib, @Drake, @kendricklamar, @jayrock, @1future, @jamesblake, @AndersonPaak, @trvisXX, #BigHawk, and @goSwaeLee. To see the full list of nominees, check out the Grammy Awards website. The 61st Annual Grammy Awards air on Feb. 10 at 8/7c on CBS.